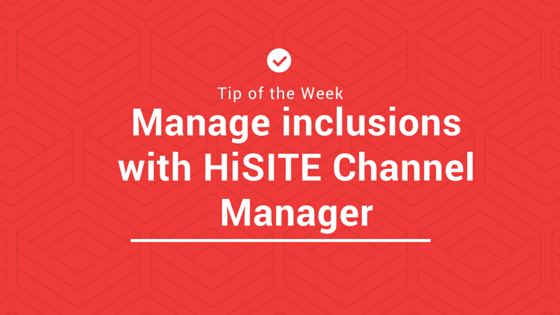 Our Tip of the Week will assist if you wish to manage inclusions with HiSITE Channel Manager. The following is a brilliant tool within HiSITE that allows you to change the inclusions over a specific date range. Let’s say you were offered a fantastic deal with a Wi-Fi company and they allowed you one month of free Wi-Fi to trial. You are able to pass this on to your guests to showcase your property and value adding to your room rate. From within HiSITE select Inventory from the main menu. Now choose which channel you would like to offer this new incentive to. Select the date range, and click on to the Update Selection button. Click on to the small red triangle to the bottom right of the rate amount otherwise known as the Control Panel. Select which room types you would like your new inclusion to apply to, then select Override Inclusions. Click on to the button to enter override inclusions for this date and complete the new inclusion field. Select the date range you wish these inclusions to span and select the Apply Changes button. Allow your update to process and once it has finished you will be returned back to your Inventory Grid and you will have successfully added overridden inclusions to your rooms.